"Let's try something new!" Laurie said last Saturday night when we were looking for some grub in Manhattan. We were in a car and looking for somewhere to go after a plan of mine fell through. We were going to get drinks and appetizers at the Four Seasons Restaurant (Gilt voucher!) but it was closed on Sundays. Oops, I didn't know. So, we were stuck looking for something else to eat but remained positive that we would find something exciting for our tastebuds. In Manhattan, there is always something new. 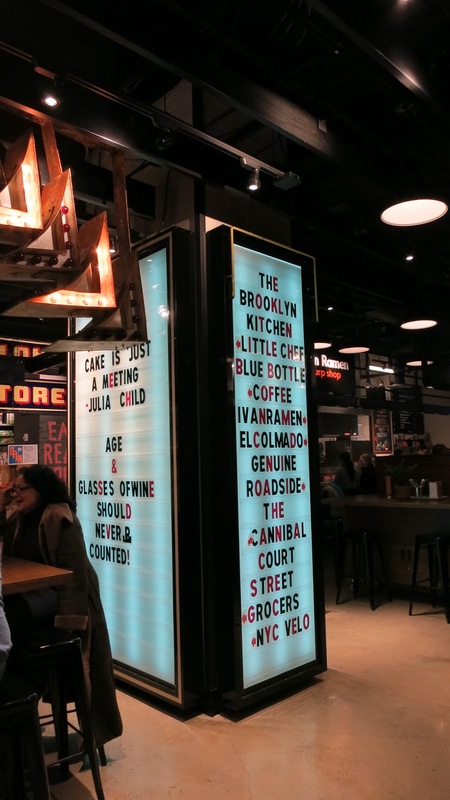 You just have to read every website or blogs just so you can stay on top of every single restaurant opening or closing happening in Manhattan/Brooklyn. Eater NY's The Shutter reports on them all the time. There's probably a monthly turnover. Our favorite reads come from Eater NY, Grub Street New York, New York Times's Dining and Wining, New Yorker, Serious Eats NY and Bon Apetit will sometimes have good restaurant features! There's a lot but we try our best to stay on top of it! Sometimes, someone is going to mention something and it will ring a bell. Gotham West Market was one of them. Here, you can find 8 high-end artisanal food vendors serving their handpicked favorites on the menu. There are Brooklyn favorites such as "Blue Bottle Coffee" and established store "The Brooklyn Kitchen". Farm-to-table delicacies from "Little Chef", artful tapas from "El Comado", charcuterie and beer from Gramercy favorite "The Cannibal". There's also a bike shop! Dave and I both tried the classic shio ramen while Laurie had the vegetarian shoyu. She also ordered half a dozen Malpeque oysters from El Comado. I thought the broth was good and maybe just a tad too oil but still light enough which I prefer. I personally do not like the signature rye noodles which is probably healthier for me but I like the traditional stuff. Maybe it should be an option. At $13 a bowl, it is also one of the smallest bowl of ramen I've had in the city but it is kind of the perfect size to pair with something else. Thank goodness I also ordered a smoked whitefish with salmon roe donburi ($12) which filled my stomach just perfectly. I can see why the ramen is so popular. It's like the perfect comfort food on a cold winter's day. This bowl of ramen will soothe the chill pains away in an instant. Reminds me of the movie Ramen Girl.